In this article, we'll cover all options provided by the WordPress Customizer for the footer. Let's go through these one by one, starting with the widget options. 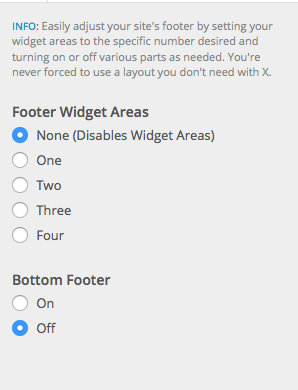 There are four different options for the widgets in the footer area. Widgets can be set from wp-admin > Appearance > Widgets. For the purpose of this article, we're going to leave it set to "on" so we can explore the other options provided by the Customizer. The next option is for the footer menu, which has a On or Off value. You can change which menu is displayed in the footer, by following our article about menus in the customizer here. The next option is for the social icons within the footer, this has a On or Off value and defaults to on. The next option available is Footer Content. This again has a value of either On or Off. You can see the content we enter in the customizer footer content area, then displays on our site, perfect for copyright notices, business information etc. The final option available in the footer section of the Customizer, is the Scroll Top Anchor. As we've set the value to On, there's also now a couple of other options shown to us in the Customizer, for the Scroll To Top Anchor. If you set the Scroll Top Anchor Position, that option is for what side the scroll to top anchor shows (left or right). 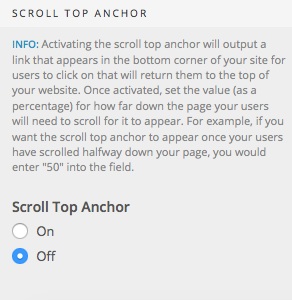 The other option is for when to display the scroll to top anchor icon on your site, in a percentage value. For example entering 50, will show the scroll to top anchor once you've scrolled down 50% of the page. Congrats! You now know more about the options available in the Customizer footer options. Footer - how to add headers?